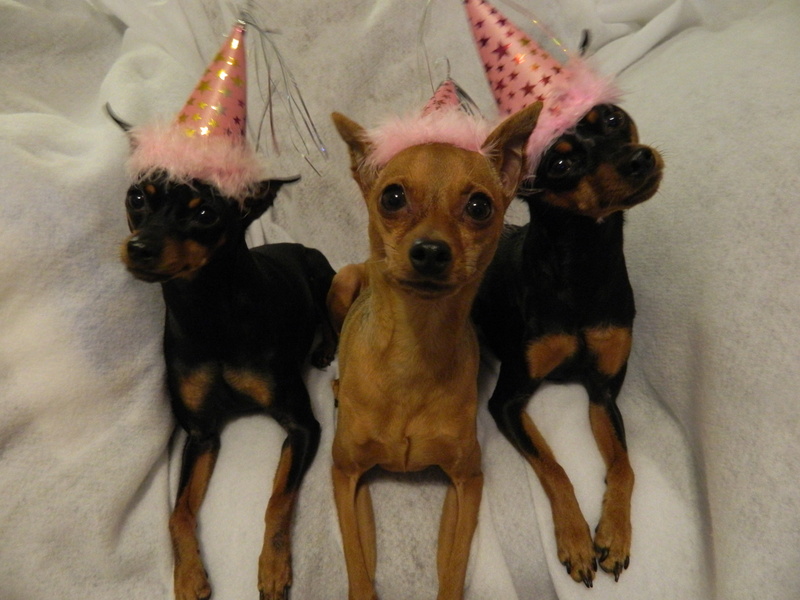 It’s hard for me to believe, but my girls are fast approaching their eighth birthday. Aspen has made the most progress over the years, but maybe she was the least reactive to begin with. She still barks a lot, but I am able to manage that behavior. Malibu is reactive to other dogs if they are too close, but her reactivity has also improved since puppyhood. 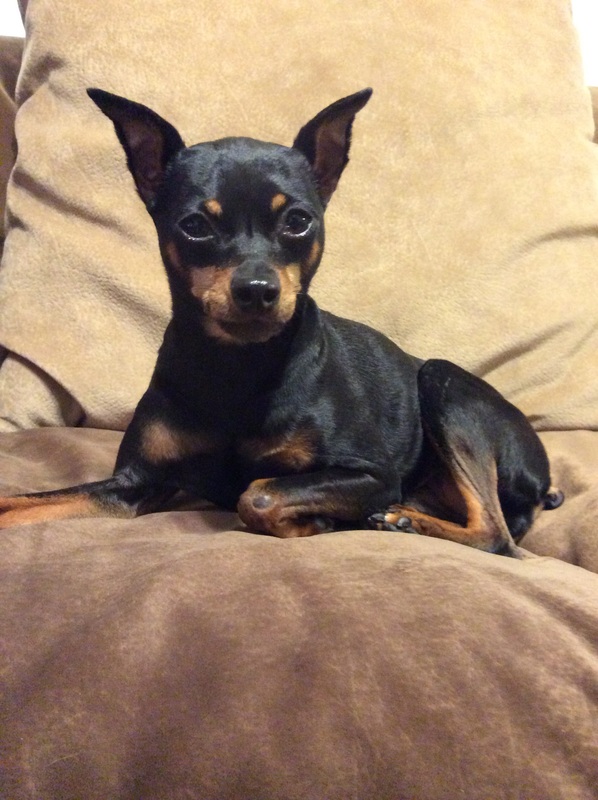 Quest is my Min Pin who I continue to worry about. Although she has been seen by two of the top rated veterinary behaviorists in the country, her issues are still present. Diagnosed with social phobia, numerous medications have been prescribed for Quest over the past six years, but they have yielded limited success. Management has been crucial in helping Quest remain sub threshold. Her latest regimen of Gabapentin and Trazodone was given for a little over a year. Although progress was observed, I did not feel that it was enough to remain on the medication. Quest has been nibbling patches of fur off of her front legs which can be indicative of anxiety. If the medication was truly beneficial, Quest would not be exhibiting that behavior. In addition, Quest continues to have “meltdowns” on a regular basis. Thinking “outside of the box”, I decided to explore the idea of animal communication. Feeling like I had nothing to lose, I began researching individuals who claim to have the ability to “communicate” with your pet via a telephone consultation. After learning about this concept, I was more optimistic than skeptical, and eager to proceed with a fresh approach. If you research the topic of animal communicators, a handful of names rise to the top. Based on client reviews, I selected Lydia Hiby to communicate with Quest. Her fee was $40 for a fifteen minute phone consultation. Once the appointment was scheduled, I prepared my questions and installed an iPad app that would record the conversation. Full of anticipation, I anxiously waited to speak with Ms. Hiby. Long-awaited answers may be just a phone call away. Finally, it was time to dial her number. After brief introductions, Lydia started the conversation by asking about Quest’s breed and color. Lydia then began to describe Quest’s “Bohemian”(yes, she used that word)personality. When she stated that Quest is a calm dog who prefers a laid-back lifestyle, I began to think that this whole animal communication idea may not have been the best investment of money. Fortunately, as our discussion proceeded, most of my skepticism was brushed aside. Once Lydia’s monologue about Quest was finished, I began to ask my burning questions. First and foremost, “Why is Quest so reactive towards dogs?” Of course, this question is in complete opposition to Lydia’s belief that Quest is a peace loving, tranquil canine. Lydia stated that Quest’s “defensive” behavior may have been learned from her mother. This response makes sense because when Quest and her littermates were about a week old, their mother’s leg was broken in a fall. I often wondered if this event had any significance towards my crew’s reactive behavior. I also asked Lydia if she knew why the medications that we have tried with Quest have not been successful. She responded that if Quest was truly anxiety ridden, one of the medications should have helped her. Since the medications have had limited success, Lydia felt that the issue is not brain-related. Instead, Lydia felt that Quest’s liver is out of balance. This weakness causes Quest to go from 0-60, from a mellow dog to a reactive one, in the blink of an eye. While a few other topics were discussed, Quest’s reactivity was the focus of our conversation. Lydia provided me with the names of two remedies that may benefit Quest. She suggested valerian for relaxation and milk thistle to balance Quest’s liver. Ever since Quest was a puppy I have been trying to find out what makes her tick. Long before her first birthday, I knew that Quest was a “special” dog. Her ever-present anxiety and over-the-top, super-charged reaction to other dogs have been an ongoing issue for the past seven years. Although Quest has been seen by numerous professionals, including two veterinary behaviorists, progress has been frustratingly slow. Last year Quest was seen by Dr. Karen Overall, who agreed with Dr. Nick Dodman’s diagnosis of social phobia. If you recognize those names, it is because both individuals are well-known and highly regarded in the field of animal behavior. Desperate for answers, I had turned to the experts. I was thrilled when Dr. Dodman provided me with a diagnosis for Quest, but my joy was short-lived when I realized that a diagnosis does not always provide a solution to the problem. Prior to seeing Dr. Overall, Quest had been prescribed various medications for her fearful behavior. Unfortunately, none of the drugs proved to be beneficial. Dr. Overall suggested Gabapentin for Quest and she has been taking it for a little over a year now. To date, it has helped her more than any of the other previously prescribed medications. Trazodone was added a few months later to maximize the effect of the Gabapentin. Although the medications have decreased Quest’s anxiety, management continues to play a vital role in minimizing Quest’s reactive behavior. Evidence that the medications are relieving Quest of some of her anxiety have been observed. Quest will now usually leave the front window of our living room, while a dog is passing by, if I offer her a few pieces of kibble. Prior to the medications, filet mignon would not have gotten Quest away from the window. Spotting a dog, Quest would bark, jump, and bounce off of the window while remaining completely oblivious of my attempts to distract her. While the medications have also removed Quest from her former hyper vigilant state, neighborhood walks are still challenging. Rather than constantly scanning for threats, Quest now only becomes fixated if she spots a moving object in the distance. If it is a dog, our worst case scenario, I try my best to keep Quest sub threshold. Again, management is critical. If possible, we “get out of dodge”. Unfortunately, we are not always able to escape and reinforcements must be called in for backup. In this case, a squeeze tube of peanut butter, baby food, or some other delicious concoction. This video was made last October after Quest had been on her new medication for a few months. You can observe Quest’s reaction to a dog being walked across the street from the sidewalk where we are walking. In this type of situation I would normally turn around and go in the opposite direction, but my goal that day was to see if Quest’s reactivity level had decreased. Although Quest appears to be “all fired up”, her behavior is an improvement over previous episodes. In the past, she would spin in circles once she reached her threshold. While she did bark and lunge in the video, she did not spin. Also noted, but not included in the video, Quest turned away to eat kibble I had tossed on the ground while the other dog was still in view. Yes, I believe that Quest’s behavior shows improvement. Since Quest was a puppy I have been trying to figure out what is going on inside of her head. Is there a reason why she is so fearful and hyper-reactive? If so, is there something that I can do to help her? I have an idea, but it is a long shot. Maybe, just maybe, I have finally found a way to reach Quest.